(Bios Life Slim ™ in Packets is Now Called "Unicity Balance ™"
Free Shipping: Use coupon code: Slim747 on checkout. Bios Life Slim ™ - Unicity Balance ™ is a product; that should be incorporated into any effective weight management program. Used in conjunction with a healthy diet and exercise, this fiber based drink provides a satisfying way of effectively managing your weight loss goals. For people on-the-go, take Unicity Balance™ with you in pre-measured and sealed packets. 60 packets per box. A “diet” is something you do to your body; Bios Life Slim ™ Unicity Balance ™ is something you do with your body. You’re gradually training your body to metabolize your food and convert it to energy rather than storing it away as fat. It usually takes about three months for this process to become permanent. Most users of Bios Life Slim - Unicity Balance ™ begin “feeling better” within days, and report that a reduction in size starts less than 30 days later. "Unicity Balance™ (also known as Bios Life® Slim or Bios Life® S) is a fiber-based, vitamin-rich nutritional supplement. Unicity Balance™ contains a blend of soluble and insoluble fibers, Unicity® 7× technology, phytosterols, policosanol, an extract of Chrysanthemum morifolium, vitamins, and minerals that when combined with a healthy diet and exercise may lower total serum cholesterol, and help achieve and maintain a healthy body weight." 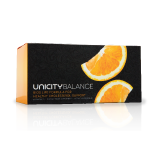 "Unicity Balance™ is a nutritional supplement designed to increase fiber intake. Each serving of Unicity Balance™ contains four grams of fiber. When taken three times daily, Unicity Balance™ contributes half of the recommended daily value of fiber. Fiber supplementation has been shown to decrease preprandial and postprandial glucose levels, lower LDL cholesterol and apolipoprotein B levels, increase satiety, and facilitate weight loss." "It's estimated that Americans consume 10-12 g of total fiber per day, less than half the amount of the recommended daily intake. Epidemiological and clinical studies have correlated high daily fiber intake with an improvement in overall health." "In addition to fiber supplementation, Unicity Balance™ contains a patented blend of phytosterols, policosanol, Chrysanthemum morifolium, vitamins, and minerals. " This product carries a guarantee. If after 30 days you are not satisfied, we'll return your money-- no questions asked! That's how sure we are this works.